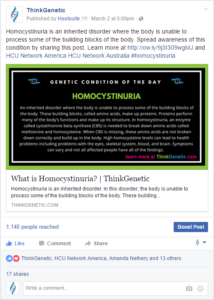 After highlighting Homocystinuria, an inherited disorder where the body is unable to process some of the building blocks of the body, in the Genetic Condition of the Day campaign, ThinkGenetic was contacted by HCU Network America to establish a partnership. The mission of HCU Network America is to help patients with HCU and related disorders manage their disease and to find a cure. They also have a goal of creating connections across the community and facilitate sharing of information and best practices through in-person and virtual events and discussions. Both ThinkGenetic and HCU Network America proudly promote each other on their websites and look forward to many joint ventures together. In the meantime, ThinkGenetic is heading to Phoenix for the 2017 American College of Medical Genetics and Genomics (ACMG) Annual Clinical Genetics Meeting in Phoenix, Arizona March 21 – 25 where we will be exhibiting at Booth #834 in an effort to continue to bring awareness of ThinkGenetic.com and the thousands of rare genetic conditions. Learn more at www.acmgmeeting.net. 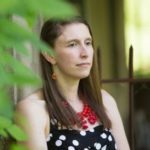 HCU Network America will be hosting a webinar on April 26th to discuss the recently published clinical guidelines on CBS deficient Homocystinuria with featuring Doctor Kimberly Chapman. Learn more at hcunetworkamerica.org.